There are a lot of similarities between Miami and Wisconsin this weekend: Red and White as team colors; “Jump Around” as the unofficial team songs (for Bucky Football, anyway); size, speed and strength as their defining characteristics on the ice. But after that, Miami and Wisconsin are 2 very different teams. This weekend, the two teams face off in non-conference action in Oxford. Blasi will have his hands full as the Badgers come in scoring 3.83 goals per game – just a touch ahead of Miami’s 3.70 goals per game, and 9th in the country in scoring. On the other hand, Wisconsin does allow the same 3.83 goals per game and is currently 52nd in the country in scoring defense, while Miami comes in at number 11, allowing just 2.2 goals per game. Another point of emphasis will be the special teams this weekend. Miami is currently killing 84.3% of power plays, including killing all 10 chances in St. Cloud last weekend. Wisconsin is 6 for 24 (24%) on their power play, so limiting the man advantage situations will be key for Miami. On the other hand, Miami’s power play, currently 7th in the nation at 27.3% will look to continue it’s torrid streak against Wisconsin’s 40th ranked penalty kill, stopping just 79.3% of their opponents’ power play chances. Wisconsin’s Goalie situation is one to be wary of. Over the last 2+ seasons, Joel Rumpel is 29-21-6 in net for the Badgers, but was injured during the second game of the season and will not play tonight. Backup Landon Peterson has stepped in nicely and sports a 2-2-1 record. He will likely start in Rumpel’s place for both games this weekend. On the Miami end of the ice, you can’t say that Ryan McKay has been anything short of fantastic so far this season. When called upon, he has been stellar and sports a 4-1-1 record including a split last weekend at St. Cloud State. We have to guess on the rotation or non-rotation status every week, so we’ll see who Coach Blasi sends out for the weekend series. Ryan McKay stops a shot by Minnesota State’s Matt Leitner in 2013 NCAA Regional action. “Jay and Ryan play extremely well,” he said at this week’s press conference. “It’s really tough to make a decision who to play in net. I wouldn’t be surprised to see them split again. How do you go against Ryan when he pitches 2 shutouts back to back? Just a gut feeling more than anything, but we’ll re-evalutate from day to day.” Lately, Blasi has been going with McKay on Friday nights, but who plays on Saturday is anyone’s guess. With another solid performance Friday, it very well could be McKay for his 4th start in a row on Saturday. Wisconsin comes in to the series having played just 6 games overall, and has had off weeks every other week it seems. They played October 18-19 at Boston College and at Boston University (2 losses and 16 goals against on the weekend), had a week off, and then hosted Lake Superior State (3-3 tie and 8-1 win). After another week off, they come to Oxford still trying to get on a roll, and will have another off week next weekend before playing their first Big Ten games the last weekend of November. Head Coach Enrico Blasi likes to get his team moving and keep them rolling. I’m guessing Wisconsin’s Mike Eaves wants to get his team rolling as well. Shaking off the rust over the first 6 weeks of the season isn’t exactly the way to do it, so this weekend, the Badgers will certainly be looking for blood. Miami won’t have it easy this weekend, but if the Badgers cannot stay out of the penalty box, they’re going to be in trouble. According to tonight’s play-by-play man Dave Starman, Wisconsin likes to pack it in on the penalty kill and this will leave the 5-forward line including Czarnik, Barber and Wideman wide open on the blueline during power plays. Look for several power play goals on the weekend from the specialty units. I can’t help myself. Miami 4-1 and 3-1. Friday’s game will be broadcast on CBS Sports Network with Dave Starman, Ben Holden and Shireen Saski calling the action. Saturday’s game can be caught on Miami All-Access. 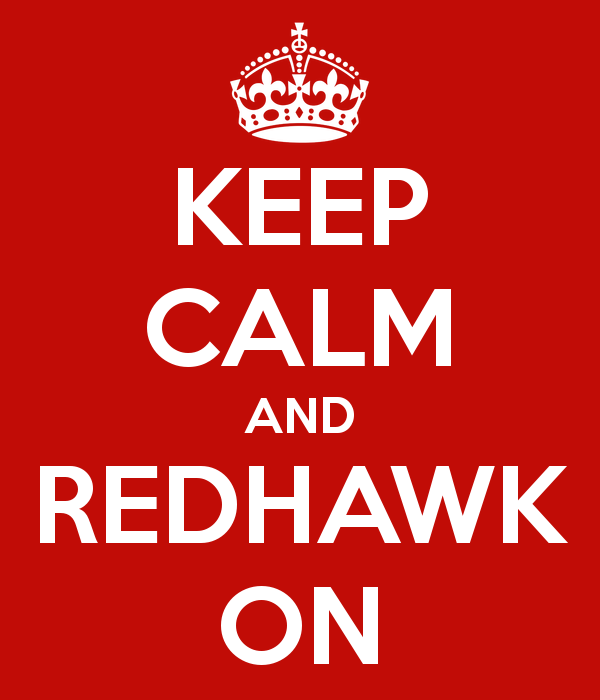 Enjoy the action and GO REDHAWKS! Miami hockey is back and better than ever! 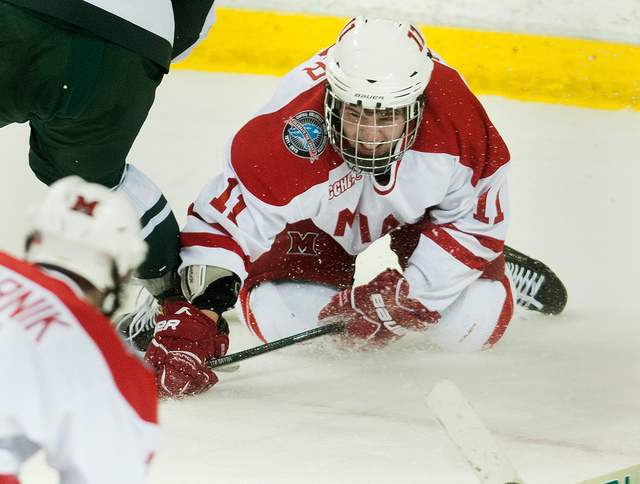 Miami is in Madison, WI for a set of 2 games against the WCHA’s Wisconsin Badgers this weekend. It will be the last out-of-conference series on the season and afterwards, the story of the standings will be a lot clearer. With all of the other 10 CCHA schools facing off against each other, Miami will come back to the pack a bit in terms of games played. Miami can only fall to 3rd in the CCHA standings, but Notre Dame, Western Michigan and Ohio State – all within striking distance – will have the same amount (16) of games played after having 2 games in hand for much of the season. The Irish(1st place and +1 point on Miami) hosts Alaska and Western Michigan (3rd, -2 points) heads to Bowling Green. Fairbanks, Alaska (Jan. 23) – #2 Miami earned five points on their longest road trip of the year defeating the Alaska Nanooks 5-0 in Fairbanks, Alaska last night. Sophomore Connor Knapp stopped all 19 shots in registering his third shutout of the season. It was Knapp’s first game action since a 2-1 loss to Robert Morris on January 10 where he made just 13 saves. His goals-against average is now a sparkling 1.95 with a 91.8 save percentage as he improved his record to 4-2-3 on the year. This weekend saw the reunion of last year’s top line of juniors Carter Camper and Tommy Wingels and sophomore Alden Hirschfeld that was so good throughout the NCAA tournament. And, they didn’t disappoint managing five points between them for the weekend. It was also nice to see Hirschfeld pick up his game as he seemed much more involved and active than I can remember seeing over the past several weeks. In addition, Trent Vogelhuber seems to have picked up some of that energy as he was also much more visible, working much harder than I have seem him. It’s good to have those two sophomores helping contribute to take some of the scoring pressure off senior Jarod Palmer and the juniors (e.g., Camper, Pat Cannone, Andy Miele, Wingels, etc.). The RedHawks jumped to an early 1-0 lead at 6:42 of the opening period when freshman Reilly Smith redirected a Tommy Wingels shot past Nanook goaltender Scott Greenham. The goal was scored 6×5 during a delayed penalty as Miami was able to control the puck in the offensive zone and find a quality chance. Miami would tally just six minutes later when sophomore Matt Tomassoni found the net off a chance on the right side. Tomassoni took a pass from senior Brandon Smith and wristed a high, hard shot that appeared to hit Greenham’s right shoulder and bounce up and over the sophomore. The RedHawks would complete their highest scoring first period of the season when Palmer scored off a feed from Andy Miele that chased Greenham from the net at 14:50 of the first period. Steve Thompson would enter the game and keep the Nanooks in it, but Miami would finish off the evening on third-period goals from Wingels and Brandon Smith to secure a five-point weekend and an enjoyable flight back to Ohio for the Red and White. Head coach Enrico Blasi succinctly summarized his thoughts on the 5-0 victory. Knapp’s shutout was the third of the season and his fifth in just 33 career games. 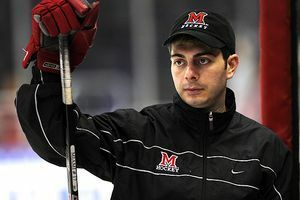 He has already surpassed last year’s two shutouts which was his first season at Miami. Wingels’ goal was his team-leading 13th of the season. He is just two goals off his career high of 15 that came during his freshman campaign in Oxford. Miami’s fourth line of Brandon Smith, Justin Vaive and Matt Tomassoni includes a fifth-year senior (Smith), the 6’6″ son of an NHL legend (Vaive) and a defenseman (Tomassoni). The line combined for 2-2-4 on the evening. Miami (16-4-6, 13-1-4-2 1st CCHA) has opened a seven point lead over second place Michigan State with two games in-hand. The RedHawks ran their league unbeaten streak to 16 games. Miami is once again atop the Pairwise and KRACH rankings and are positioning themselves for a number one seed in the NCAA Tournament should their good play continue. One of the key components of the Pairwise Rankings that effectively determine the 16-team NCAA Tournament, is record against Teams Under Consideration (TUC’s). The top 25 teams in the Pairwise are ranked and defined as “under consideration.” Miami has played 26 games this season with 18 of them coming against TUC’s. They are 12-2-4 in those games having played the 7th most difficult schedule in the nation and have achieved the 2nd best winning percentage in the country. However, only Miami’s series with Lake Superior State is against another TUC for the remainder of the regular season meaning it will help Miami’s Pairwise if the top teams they have already played, and beaten, such as Ferris State, Michigan, Notre Dame, New Hampshire and St. Cloud State continue to win. Miami returns home for the next two weekends starting with a two-game series against the CCHA’s last place team, Western Michigan January 29-30 followed by what is shaping up to be a big series against fourth place Lake Superior State. The Lakers are having a surprisingly nice season and are in line for a first round bye in the CCHA playoffs. After two weeks on the road, Miami will not leave the state of Ohio until at least the CCHA championship weekend in Detroit in late March. 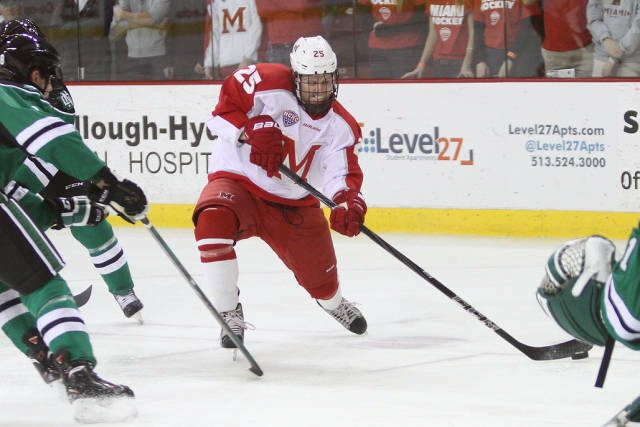 Ohio State’s victory over Michigan State coupled with Miami’s win in Fairbanks enabled the RedHawks to open a seven-point spread over the second place Spartans in the CCHA. It’s roughly a 2 1/2 game lead since CCHA league wins are worth 3 points each. #8 Ferris State 3, Michigan 2 – Ferris earns the split in the second half of the home-and-home from Ewigleben Ice Arena in Big Rapids, Mich.
#3 Wisconsin 4, #1 Denver 3 – The Badgers take 3 of 4 points from the Pioneers in Madison opening the door for #2 Miami to return to the top of the polls this week. #14 Bemidji State 5, #4 Minnesota-Duluth 4 – The Beavers of the CHA sweep the first place team in the WCHA. The sweep effectively silences the noise-makers from that western conference whom as we know, can do no wrong…for a few minutes at least.